As part of our work to develop ethics guidance for the responsible and ethical inclusion of pregnant women in the HIV research agenda, we publish papers and author book chapters describing our intermediary findings and processes. CB Krubiner, et al. 2016. AIDS. "Concerns about including pregnant women in research have led to a dearth of evidence to guide safe and effective treatment and prevention of HIV in pregnancy. We conducted a series of group and one-on-one consultations with 62 HIV investigators and clinicians to elicit their views and experiences conducting HIV research involving pregnant women. Challenges to conducting research on pregnancy and HIV included ethical concerns, legal concerns, financial and professional disincentives, and analytical and logistical complexities. Advancing such research will require clearer guidance regarding ethical and legal uncertainties; incentives that encourage rather than discourage investigators to undertake such research; and a commitment to earlier development of safety and efficacy data through creative trial designs." MO Little, et al. 2017. Clinical Research Involving Pregnant Women (eds. Baylis and Ballantyne). 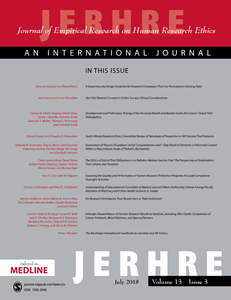 "In this chapter, we describe two key lessons about research in pregnancy from the context of HIV/AIDS: first, why addressing the health needs of pregnant women, not just the needs of their offspring, is so critical; and second, why doing so is immediately possible, even as we work to resolve certain ethical and regulatory debates, particularly about when it is appropriate to impose foetal risk without the prospect of foetal benefit. In particular, the HIV/AIDS context shows how treatment or prevention of maternal disease often entails not just risk – but the prospect of benefit – to the foetus; and creative trial designs can advance no-benefit studies without imposing foetal risk in the first place. For all the challenges that research with pregnant women entails, the HIV/AIDS context reveals that it is possible to conduct a wide range of important research during pregnancy that is both ethically responsible and consonant with US regulations." AC Mastroianni et al. 2017. Hastings Center Report. "U.S. researchers and scholars often point to two legal factors as significant obstacles to the inclusion of pregnant women in clinical research: the Department of Health and Human Services’ regulatory limitations specific to pregnant women's research participation and the fear of liability for potential harm to children born following a pregnant woman's research participation. This article offers a more nuanced view of the potential legal complexities that can impede research with pregnant women than has previously been reflected in the literature. It reveals new insights into the role of legal professionals throughout the research pathway, from product conception to market, and it highlights a variety of legal factors influencing decision-making that may slow or halt research involving pregnant women. KA Sullivan and AD Lyerly. 2017. BMC Reproductive Health. "Though many women in need of access to HIV preventive regimes are pregnant, there is a dearth of data to guide these care decisions. While oral pre-exposure prophylaxis (PrEP) has been shown to prevent HIV infection in numerous high-risk populations, pregnant women have been excluded from all major prospective trials. We propose for ethical examination a theoretical trial—a prospective, observational study of PrEP for pregnant women at risk for HIV in sub-Saharan Africa—highlighting an ethical tradeoff that characterizes issues faced for advancing research in pregnancy... While an observational cohort is potentially the most ethically and scientifically justified research design to study PrEP in pregnancy, earlier involvement of pregnant women in studies of newer preventives may lead to evidence that is more timely and robust." KA Sullivan et al. 2018. Journal of Empirical Research on Human Research Ethics. "We conducted in-depth interviews with 140 pregnant women living with or at risk of HIV—70 in Malawi, 70 in the United States—exploring their views on requiring paternal consent for pregnant women’s participation in trials offering the prospect of direct benefit solely to the fetus. The majority of women supported such a requirement; others raised concerns. A trio of themes—the father’s or pregnant woman’s rights, fetal protection, and gender/relationship dynamics—characterized views both supporting and against a paternal consent requirement, expanding the range of considerations that should inform approaches to paternal involvement in research with pregnant women." MN Wickremsinhe et al. 2018. Journal of Women's Health. "We employed a keyword search of the International Clinical Trials Registry Platform to identify interventional HIV-related trials conducted with pregnant women between January 2001 and December 2015. In total, 63 trials studying use of a pharmacological compound during pregnancy were conducted across 35 countries and sponsored by 74 unique organizations, including pharmaceutical companies. Our findings demonstrate that trials with pregnant women are conducted across a range of countries and sponsors, and much progress has been made to better address pregnant women's own health needs in HIV research. However, our findings confirm other concerns, for example, lack of HIV preventives studied and the lag between medication licensure and study during pregnancy."